It’s Summer and so you have to put up with me writing about vegetables. Vegetables from my garden. Stuff I make from the vegetables from my garden. This has been an odd year. Cool temps too long in the early planting months, too much rain, not enough sun or too much, smothering hot days with stratospheric humidity to go along with the heat. As a result, the “crops” have struggled a bit – the tomatoes are numerous, but slow to ripen and the plants are leggy; the cucumbers are fabulous, crisp and tender and sweet, but not as bountiful as you’d expect; same with the green beans, which is too bad because Fergus loves them; the yellow Summer squash, small plants and few in number (I know! A shock! ); and the Swiss chard germinated quickly, but hasn’t gotten as big as it should. I patiently wait. The zucchini, however…I actually think after the apocalypse survivors should plant zucchini, it’ll grow and be prolific no matter what the conditions. Every year, I grow Ronde de Nice. They are round, as the name suggests, a French heirloom variety. 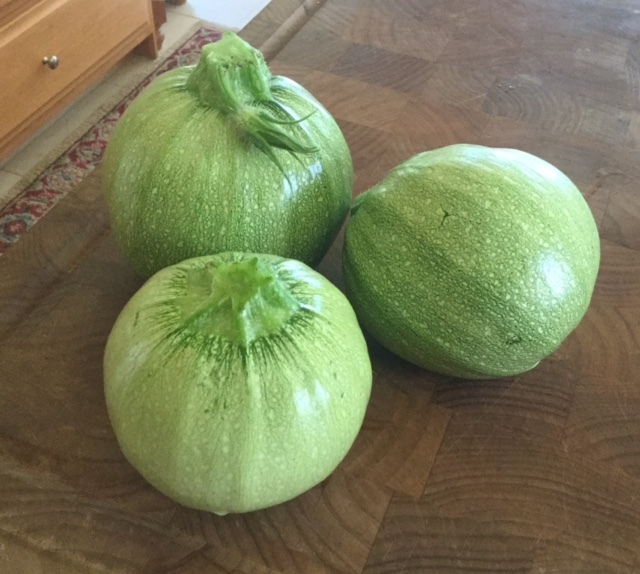 I love them because they have a flavorful, tender and creamy flesh and, if you pick them early when they are tennis ball to baseball size, have very few and tender seeds. In previous Summer posts, I’ve shared a couple of ways I prepare them. 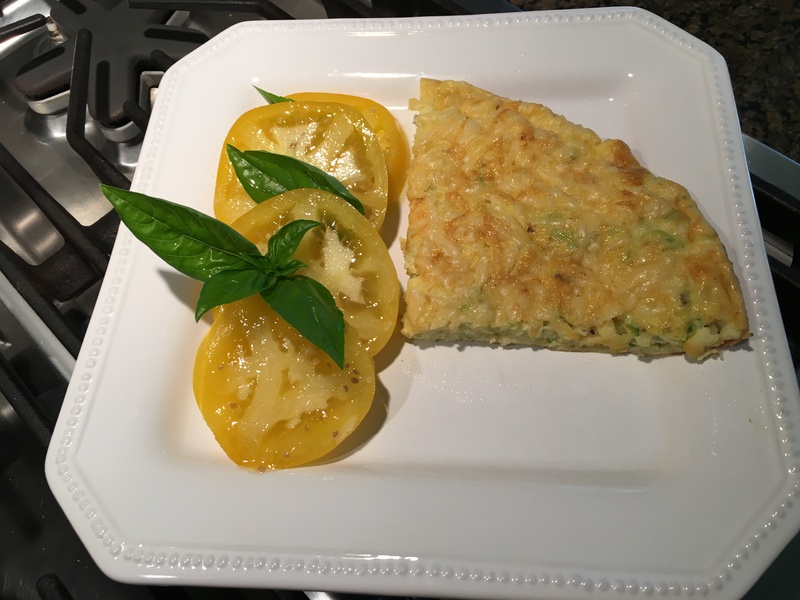 Of the three, the two I made up are my favorites, and of the two, I’d have to say this frittata wins. I love frittatas. 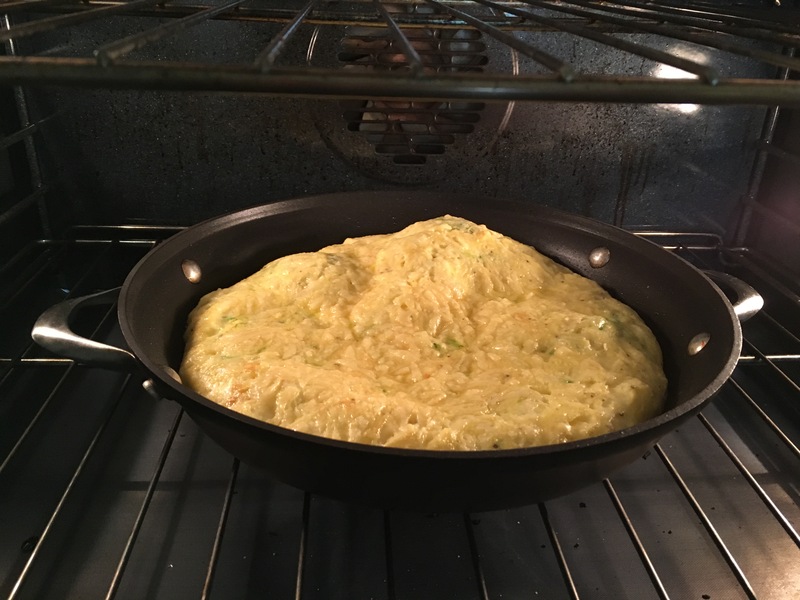 I love eggs and I like that while it’s finishing in the oven, I can clean up the kitchen, or – if I’m doing it for a brunch – sip on a Pomosa while everyone is easing into the meal. 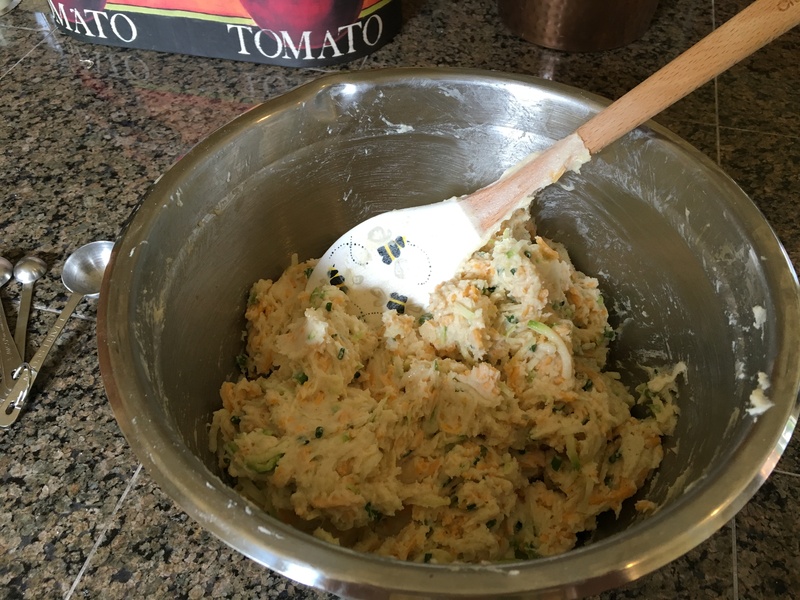 I had about two cups of shredded zucchini left from the cheesy bread recipe I’m including below. I figured it would be tender and fast to use as the base for a frittata. Whoa, so good. 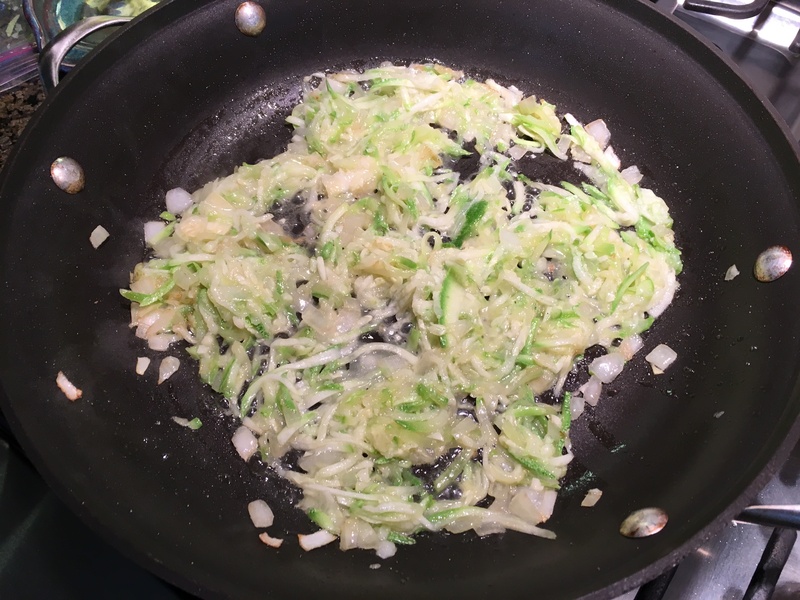 In an oven-proof pan, sautée the onion until it was starts to soften, then add the zucchini and minced garlic. When everything is tender and fragrant, pour in the egg mixture. 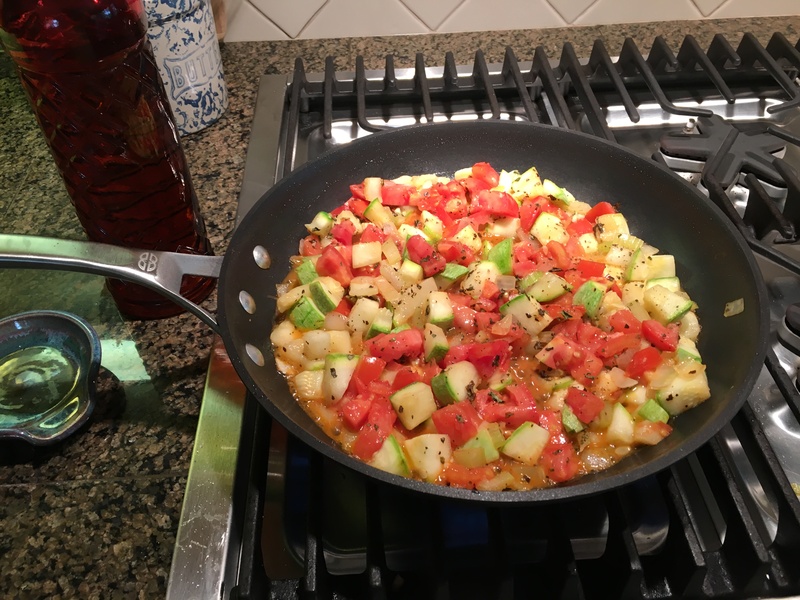 Let it cook gently at a low medium temp for just a couple of minutes, stirring just a bit to loosen the edges and evenly distribute the sautéed vegetables. 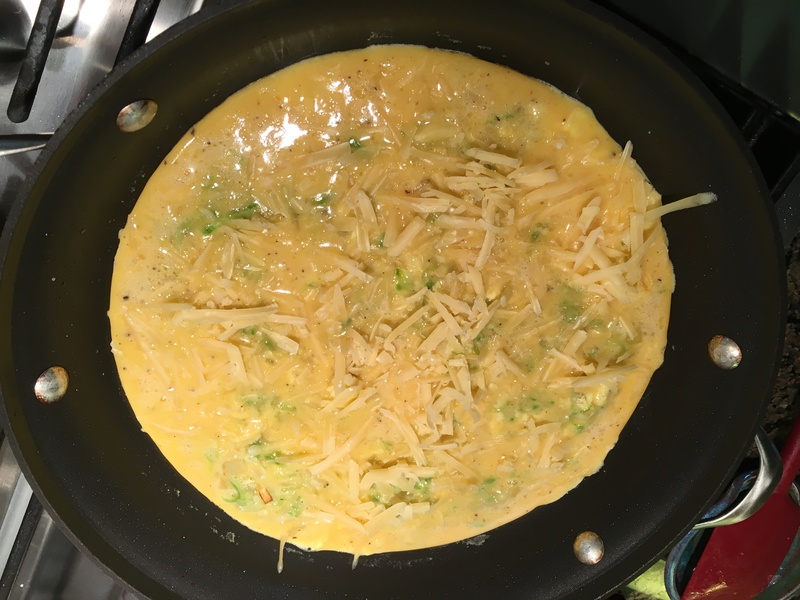 Sprinkle the shredded cheese over the top and put the frittata in the oven uncovered. 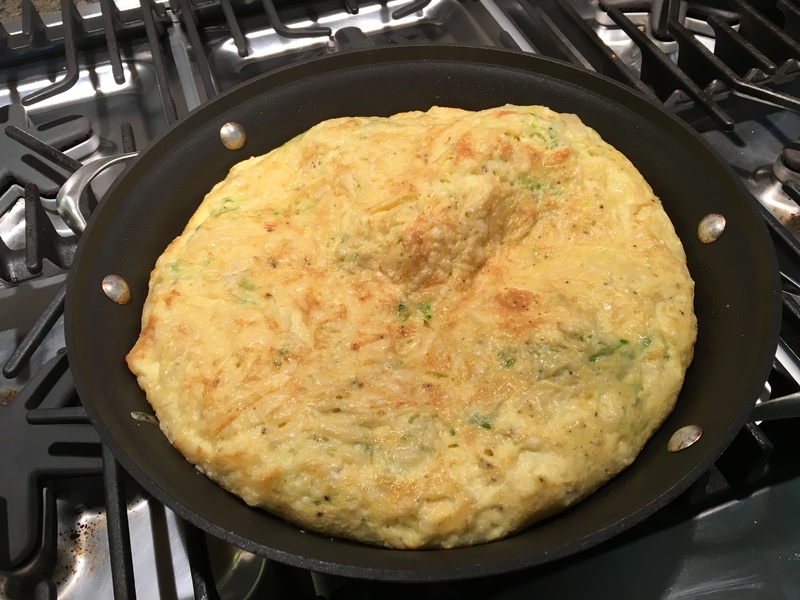 Bake for about 15 minutes or until the frittata has puffed up, the cheese is melted and the top is golden. The sides may start to pull away from the pan slightly. Remove it from the oven and let it exhale. Cut into wedges and serve. I had mine with a sliced yellow tomato drizzled with my new favorite jalapeno infused olive oil. My Wonderful Neighbors, have been sharing their tomatoes with me since mine aren’t ripened yet, so I’ve been trying to find ways to use those up, too. I put together a zucchini/tomato “sauce” for pasta the other night. Yum. Finally, the recipe that I cadged off of Pinterest last weekend. 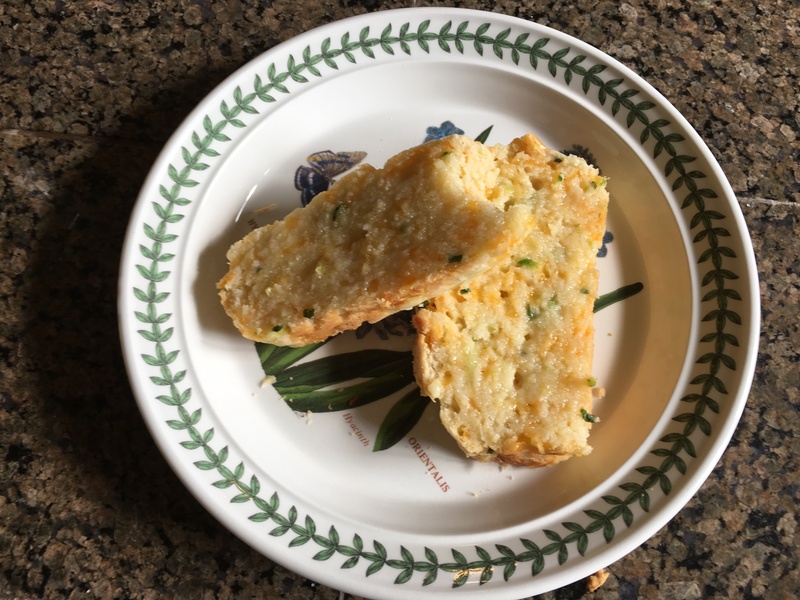 I’ve enjoyed slices of this scrumptious Zucchini/Cheddar/Buttermilk and Chive bread warmed with a bit of butter or softened cream cheese for breakfast a few mornings this week. It’s moist and flavorful. 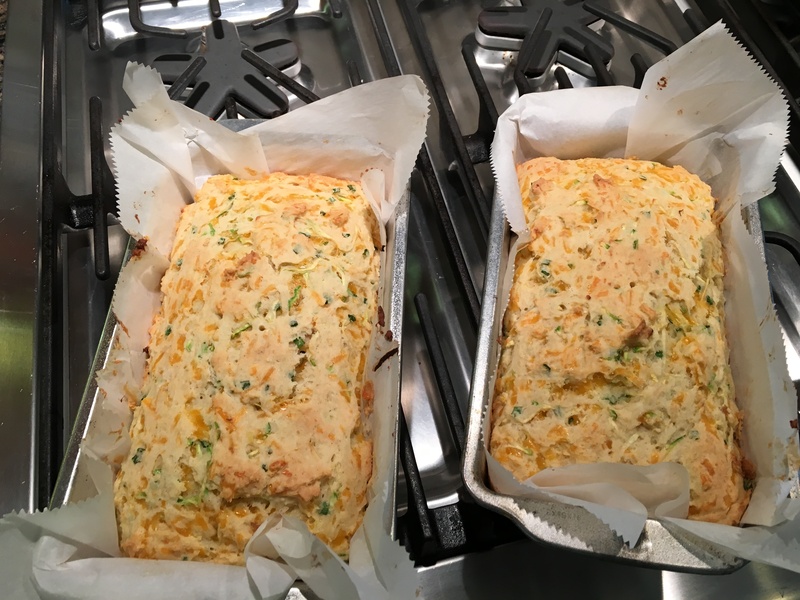 I bumped up the chives and the cheddar (I used sharp) a bit just because I had a little more of those. 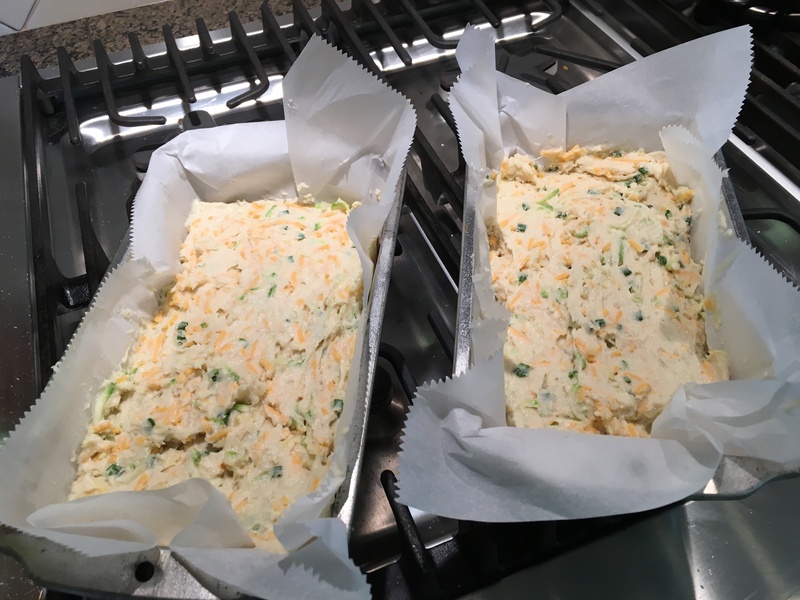 I had never lined a loaf pan with parchment before, as the recipe calls for, but it worked really well and it makes for much easier clean up. A Pretty Life in the Suburbs is a good blog, by the way, with lots of recipes, home and garden and DIY/craft ideas. …went crazy at the patio door and, lo, there was an enormous black bear standing there looking in at us, having just demolished the bird feeder station. I fetched my Glock from the gun safe, penned up wee Fergus who was beside himself with fury, and went out to fire impotently at the long-gone-bear’s disappearing tracks into the woods. I’m hopeful the big booms kept him/her running for some other hills. Best luck, the electric fence around the beehive is running its 10,000 volts and so the bees and their honey are safe. At least for now. 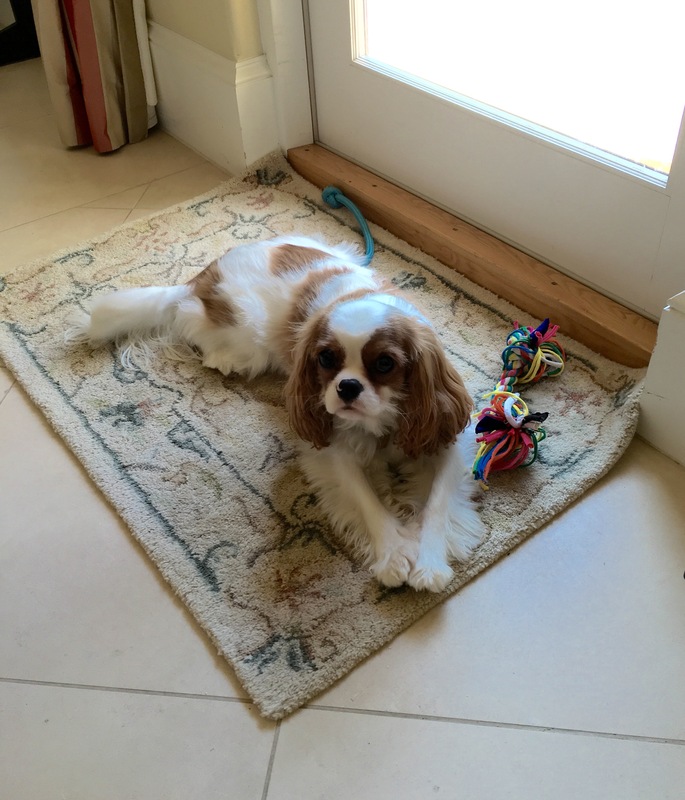 Sadly, Fergus and I will be walking the property on the long lead, with me packing a cell phone and a Glock for the foreseeable future. Sorry kiddo. 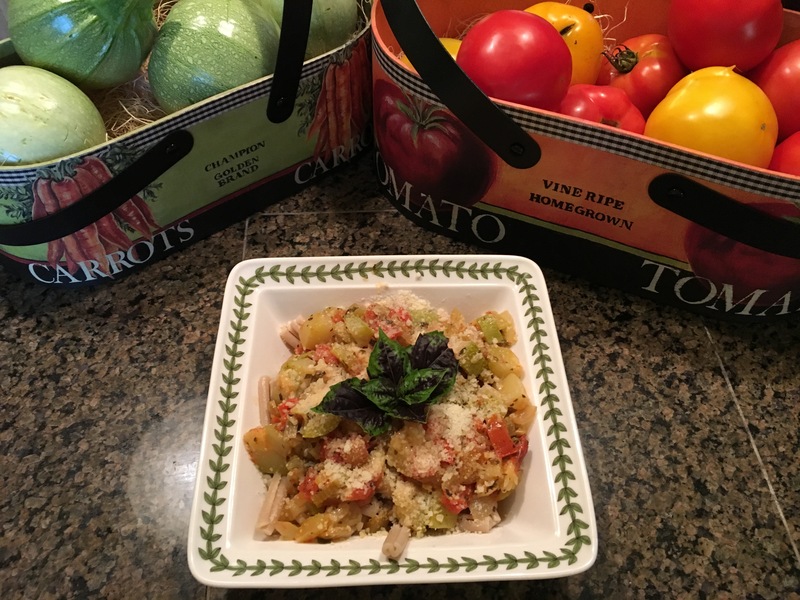 Do you have great Summer vegetable recipes you like to make? Are they family favorites or do you make stuff up on the fly the way I do? 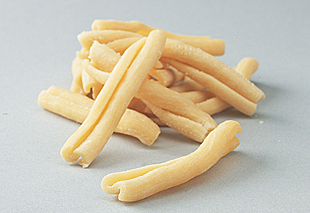 1 Casarecce pasta is shaped like a very narrow, twisted and rolled tube. This pasta is best used when served with chunky sauce and can be used in a variety of casserole dishes. 2 The most reliable method to cook GF pasta I’ve found is to add it to boiling, salted water and boil for about 3 minutes, then cover and turn off the heat, allowing it to sit for 10 more minutes. Drain and serve immediately. GF pasta doesn’t always reheat well, it can disintegrate on second cooking. Leave a reply on "101 Ways to Fix Zucchini, or About A Bear"